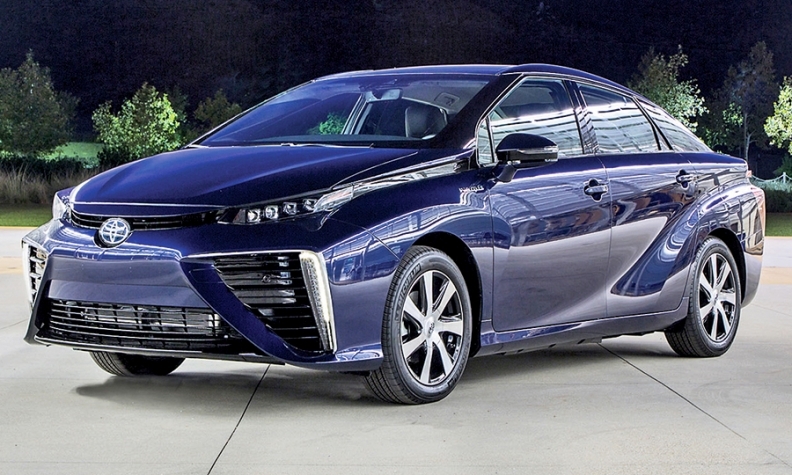 Toyota plans to sell 30,000 fuel cell vehicles such as its new Mirai by 2020. TOKYO -- Toyota Motor Corp. aims to sell 30,000 fuel cell vehicles and 7 million additional hybrids by 2020 as part of a sweeping new environmental plan to slash carbon dioxide emissions. The carmaker’s top brass outlined the objectives today as the Toyota Environmental Challenge 2050, aiming to all but eliminate the carbon footprint of its fleet and factories. The vision reduces the traditional internal combustion engine to just the tiniest sliver of Toyota’s total deployment by 2050. The goals signal a ramped-up push by Toyota to establish itself as a global clean car leader. And they dovetail with last year’s release of Toyota’s Mirai hydrogen fuel cell vehicle and next month’s launch of the next-generation Prius flagship hybrid. Toyota’s focus on hydrogen and hybrid technologies draws a clear battle line against Volkswagen AG. The German rival staked much of its own green car strategy on clean diesels only to suffer a backlash after admitting it rigged emissions tests. Indeed, Toyota said it now aims to sell 30,000 hydrogen fuel cell vehicles by 2020. That compares with Toyota’s production plan of just 2,000 such vehicles in 2016. To help, Toyota will start selling hydrogen fuel cell buses in early 2017. Toyota is now selling around 1.27 million hybrids annually. It notched cumulative sales of 8.05 million this past summer. Toyota is already on pace. When its new assembly plant in Mexico opens in 2019, it will achieve a 40 percent reduction in per vehicle emissions from the company’s 2001 baseline. And Toyota’s plants in Brazil already generate all electricity from locally produced wind, biomass and hydroelectric power.